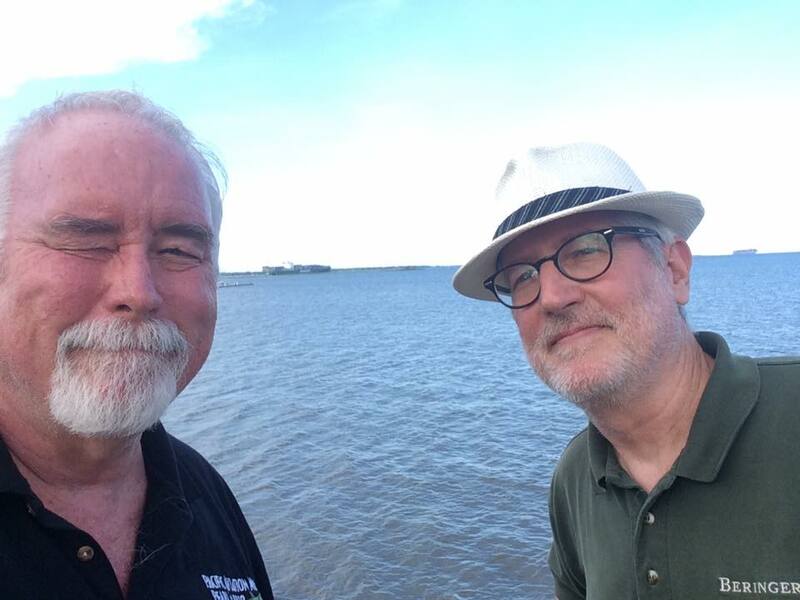 Burl and me, with Fort Sumter so far in the background you can’t quite make it out. It was great getting to see my old high school classmate Burl Burlingame — and his wife Mary, also a veteran journalist (and night editor at the Honolulu paper) — the last few days. 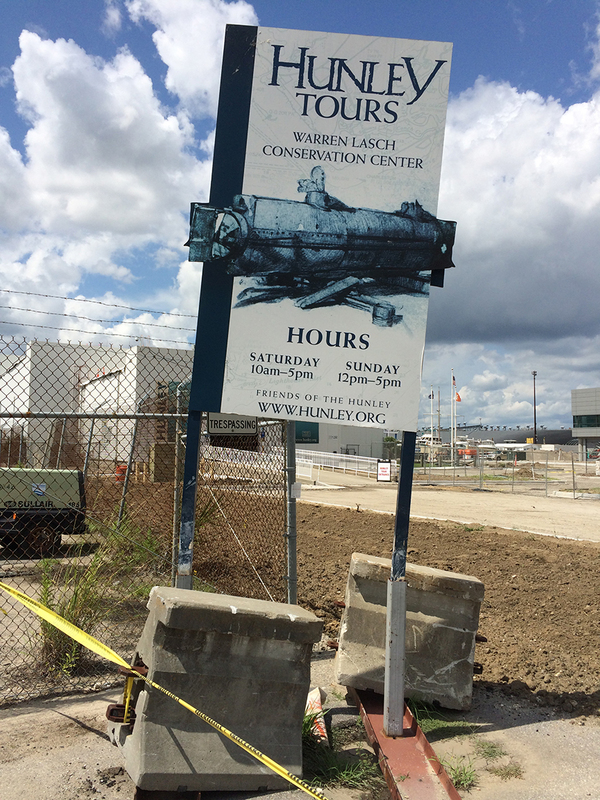 The exterior of the Hunley museum/research site is undergoing improvements. As you know, he was here for the International Plastic Modelers Society’s 2016 National Convention & Contest, where he was both a presenter and contestant. He gave a great talk Saturday morning about what most people don’t know about Pearl Harbor, from which I learned a lot. After that, I accompanied the Burlingames to Charleston to see the Hunley. Of course, I couldn’t help telling the guide that “You realize this is the world’s leading authority on Japanese midget subs,” thereby putting pressure on both the guide and Burl. But Burl was up to it, and he was fairly impressed with what the Hunley folks had accomplished. I was, too. I remain amazed that they were able to remove all that concretion from the outside and the inside of the sub without destroying the whole thing. We capped the weekend by cooking out at my house, where Burl and Mary met a few folks I thought they might like to meet, plus most of the Warthen clan. A good time was had by all. Or by me, anyway. 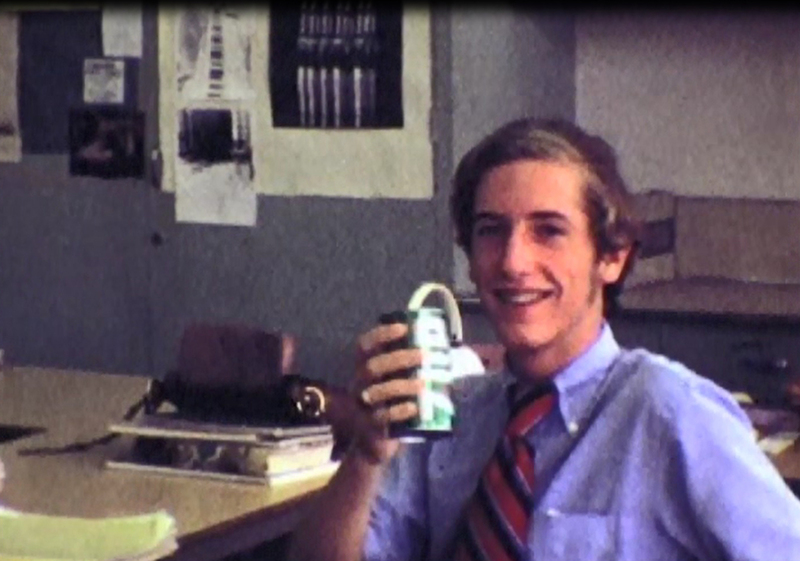 From the home movie: The future founder of the UnParty enjoys an Uncola, in 1971. If you’re not a military brat like Burl and me, you might not realize what a special thing it is for your friends and family to meet one of your high school friends. Before meeting Burl on our way back from Thailand last year, my wife had met exactly one of my high school friends — briefly, in 1975. Burl brings the total to two, out of a class of 600. 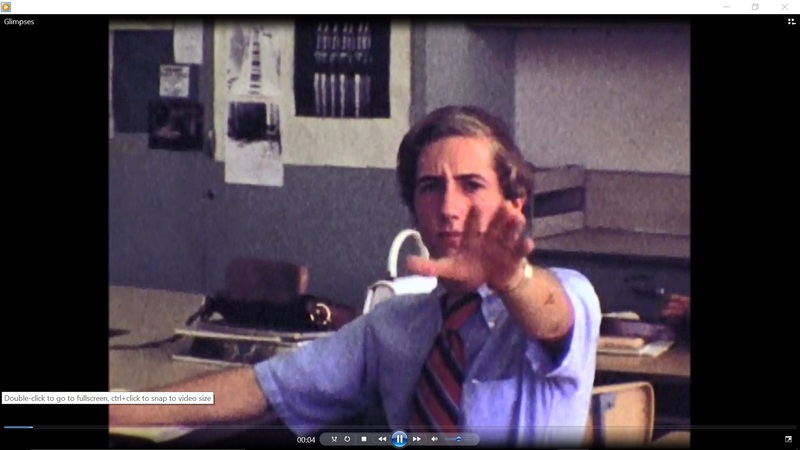 Burl and I graduated in 1971 — as part of the festivities Sunday night, I showed some Super 8 movie footage (silent, of course), recently digitized, from our last days of high school. As it happens, my Dad shot some footage of me talking with Burl and another friend or two outside the HIC on graduation day — at a distance, with a feel like surveillance film. Unfortunately, you mostly just see the back of Burl’s head. But there is one split second when Burl leaned toward me to make a point, and you can barely make him out. One’s youth can be so elusive. It’s tough to recapture. It’s the only photographic evidence that we knew each other, all those years ago. Burl noted last night it was sort of our version of the Zapruder film. This would be extremely difficult for today’s 17-year-olds to imagine, as they text out pictures, and HD video, of themselves with their friends on an hourly basis, if not more often. Here’s hoping it’s not another 45 years before we meet again. Congratulations to Samuel Tenenbaum (on a milestone I’ll never achieve)! 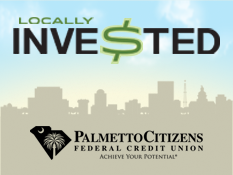 Have you voted yet? How did it go? There’s my famous daughter, in Dance Magazine! This entry was posted in Personal on August 8, 2016 by Brad Warthen. So what do we do our last night in Columbia? Go see the new “Independence Day” movie, which was so grandly visual and deeply stupid that it is a parody of itself. It would almost have to b. And yet, the original was so entertaining. I suppose Will Smith was too busy with “Suicide Squad” to breathe life into this one. But ….. ID2 was paced brilliantly and the tone was consistent throughout. I think it was deliberate parody. I was curious because the weekend the film opened, I was briefing writer-director Roland Emmerich about WWII in the Pacific. He’s planning a film about the battle of Midway. Will the new “Midway” movie have the usual modern day cast, black lead character, female who tags along and saves the day, fat guy who is there just for laughs? Then add in an overwhelming amount of CGI for action scenes where the main characters will do quintuple flips 20 feet into the air, land on their head and get up and continue as if nothing happened? It’s to the point that I don’t even bother watching action movies anymore because they’re ruined by cartoon looking CGI. Hmmmm, a movie about the Battle of Midway? I would be very interested to see how that movie stands up to the the 1976 version. While I love the way the original movie goes through the tactics and shows how military intelligence is never a certain thing, the movie does come off a bit stiff at times. What do you think about the USS Independence movie set for release later this month? It’s a great story, but then again, it has Nicolas Cage in it, so I’m sort of pessimistic. Think Firebirds but with a ship instead of a helicopter. Why? Because film was expensive, and so was getting it processed, and I didn’t want any more of my film being wasted by someone shooting ME. I wanted to use it to shoot images of my friends whom I would soon leave and (in 99 percent of cases) never see again. I just want to go back in time and shake my younger self for having been so careless and random in shooting this tiny bit of footage. With the exception of a couple of girls I dated and another one I wish I COULD have dated (but she was way too beautiful and intimidating), my decisions about where to aim the camera seem to have been accidental. For instance, one of my less-favorite teachers makes two appearances, and my very favorite teacher of all time, the lovely Elizabeth Burchard, doesn’t appear at all. It’s like I turned the camera on and waved it around without thinking where it was pointed. And I did so LITTLE of that. All of this high school footage makes up a portion of one roll of Super 8 film. I should have shot roll after roll, regardless of expense, even if I had to wait years to pay to process it. What a missed opportunity. … or once or twice, anyway. Then there was the Memphis State me, who worked for the school paper and started thinking of himself as a journalist.